So yesterday was a glorious winter’s day and I decided to take a walk down to the beach area of Bondi. There were lots of people around – as there often is on Sunday morning – with Bondi markets etc. and Bondi was buzzing. But as I walked I really felt overwhelmed with all the development that is happening in Bondi. I usually walk towards the promenade from the walk-bridge that is almost opposite where the Diggers once stood (now of course, apartments) – the bridge that leads to the side of the Bondi Surf Club. Now I’m pretty sure I’d walked there only a week ago or so ago, so sometime in the last week or so an incredibly ugly symbol of tourist cow-towing looks like it has sprouted from the pavement beside the bridge. I’m sure Waverley Council must be very proud of this structure but it really annoys me. It is ugly and I believe very unnecessary. Bondi Beach is not a very big area actually. 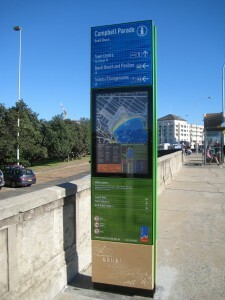 And all this signposting and touristifying is turning Bondi into a big monopoly board. Surely tourists don’t need to be told that if they look over yonder or walk about 2 minutes ahead they’re going to hit the Bondi “Town Centre!” I know, we have to consider that all-important tourist dollar ,but I think signposts like this are an eyesore and I just don’t see how this adds real value to the Bondi landscape. Given that we live in an age where the internet and information is literally at our fingertips I do wonder why a decision was made to put this thing up. all for the tourist dollar...and how necessary is this information here, really?? I realise that ranting about this tourist signpost might seem relatively insignificant but it’s just that when you look further up the road and you see the Bondi Hotel contruction site and the rest, it all gets a bit too much! I agree with you on all this signage (a bit like a mini ‘Vegas’ really). I can think of better things they can do with the money that was spent on making/erecting these totum poles of information! Development Shmelopment! What a lovely and hillarious phrase. Although, not in the same words, i have been thinking the same thing about my home town – where it seems things are constantly being knocked down and rebuilt for no readily apparent reason. What a waste of everybodies energy.